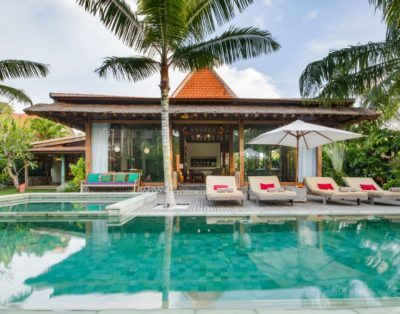 A 4 bedroom villa with ocean views that boasts a contemporary, environmentally friendly design and features bespoke Balinese furnishings. 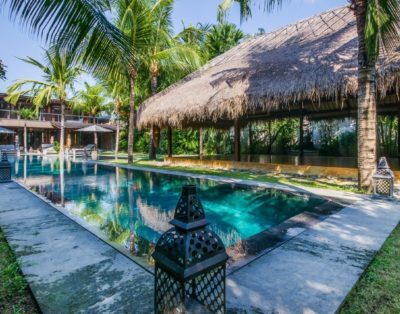 It is conveniently located in the heart of Canggu, only 500 meters to Echo Beach, and is in walking distance to bars, restaurants & boutique shops. 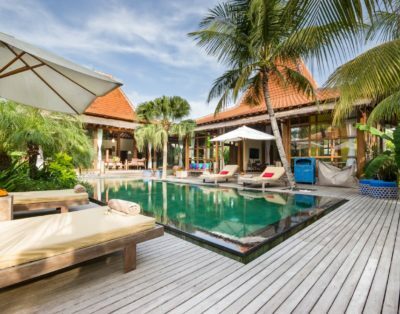 Eco-luxury refers to the elements that have been chosen to outfit the villa such as recycled materials from the island and the lush gardens that surround the property. 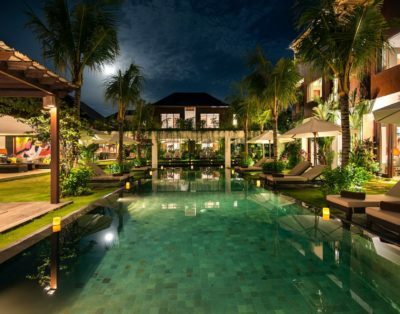 Located in the heart of Canggu, with easy access and short walking distance to trendy local bars, restaurants, cafes, clubs, pharmacy, salons, supermarkets & boutique shops. 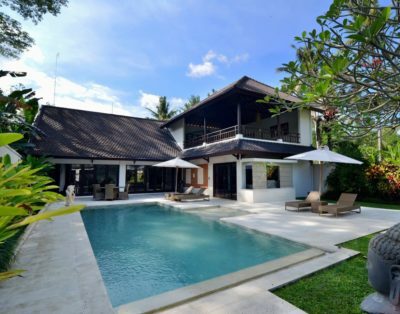 Villa Nedine occupies three floors (Ground: 3 bedrooms, swimming pool, garden, outdoor living area, car park; Level 1: kitchen, living area, guest’s restroom and balcony; Level 2: master bedroom and terrace). Pool size: 4.2m x 1.5m x 12m swimming pool with 2 lounge chairs and a pool umbrella. Capacity: 8 guests; 4 bedroom 4 bathrooms (4 double beds). One extra person is allowed at an extra charge. Entertainment: 3m x 3m sliding screen with projector in the living room with built-in speakers; Netflix. Parking: Available for 1 car and several bikes. Dining: Can seat up to 10 persons (at small bar area in the kitchen and dining table). Kitchen: Equipped with Refrigerator, Freezer, Oven, Micro-wave, DeLonghi Coffeemaker, Blender, Toaster. Rates include daily breakfast, welcome drink, WiFi, and services by a butler, villa attendant (7AM – 7PM), pool maintenance, security and gardener. Private chef service is available on request at IDR 350,000+ or USD 25+ per meal and IDR 500,000+ or USD 35+ per day (lunch & dinner), excluding grocery cost + 15% handling fee. Airport transfer service is available on request – please contact us for a quote. Car and driver rental service on request from approximately USD 60 nett (including petrol) for 8 hours a day. Fast Track service at the airport is available at USD 55 nett per person. Art and cultural activities, cooking lessons or spa treatments menu are available on request (charges apply). Babysitting service available on request (charges apply). Baby cot is charged at USD 10 nett per unit per day and high chair is charged at USD 5 nett per unit per day. Maximum 1x extra bed is available on request at USD 35 nett per bed per night. 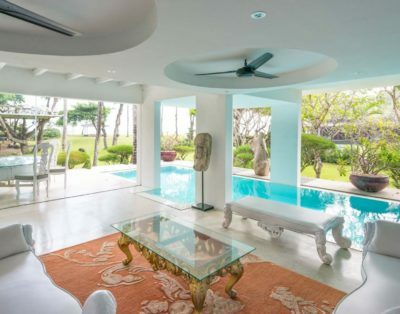 Rates quoted refer to the maximum occupancy of the villa, as shown in the provided publication and invoice. The number of persons (adults and children) staying at the Property must not exceed the maximum number of sleeping places indicated in the booking confirmation and reservation voucher, unless specifically authorized in writing. Exceeding the number may invalidate any insurance policy on the Property. Entry or access to the Property may be refused or limited where the number of guests exceeds the stated requirement. No pets are allowed unless agreed in writing in advance. Late check-out or early check-in is subject to availability upon request and depending on occupancy. Surcharges will apply. Please be informed that Bali island celebrates Nyepi (Silent) Day each year on below dates. The Nyepi (Silent) Day is a day of absolute silence throughout the island and it starts at 6 AM that day and finishes 6 AM the following day. No outdoor activities are allowed and there will be no check-in and check-out from properties on 25 March 2020, and 14 March 2021.